Forrest Gump score to get first LP release - on chocolate-coloured vinyl | What Hi-Fi? 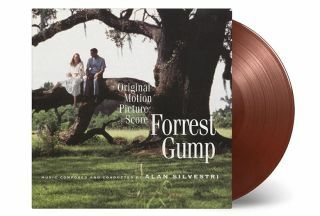 More than 20 years after it was nominated for an Oscar, Alan Silvestri's original score for Forrest Gump is getting the full 180-gram audiophile treatment. We all know the line about life and chocolate, but in the case of this particular chocolate (or chocolate-coloured vinyl, to be precise) you know exactly what it is you're going to get. Alan Silvestri's work for Forrest Gump was pipped to the 1994 Oscar for original score only by Hans Zimmer's The Lion King, and in September it's getting its first vinyl release. Pressed to 180-gram audiophile vinyl, only the first run of 1,500 copies are to be chocolate-coloured. So you'll need to run, Forrest, run if you want to snap one up. Coloured vinyl is nothing new, of course, but nor would it have been that novel were it pressed to real chocolate. We looked back over vinyl's weird and wonderful history a few months ago and found chocolatier Stollwerk created a player that reproduced music etched in grooves in chocolate way back in 1903. Then, more than a century later (in 2012), French electro producer Breakbot released a special-edition chocolate version of his record By Your Side. Still we'd bet on this record sounding a little better, as well as lasting somewhat longer in your collection. You can pre-order Forrest Gump on vinyl now or find out more via Music On Vinyl.